U-Haul has established a culture of healthy living for its Team Members throughout the U.S. and Canada. Now others are honoring the industry leader in do-it-yourself moving and self-storage for the bold steps it has recently taken. 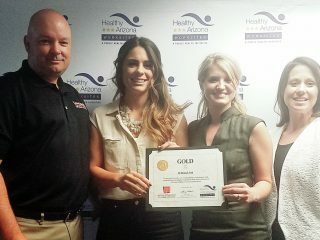 The Healthy Arizona Worksites Program presented U-Haul International, Inc. with its Gold Standard Award on June 23 during a ceremony celebrating employers that have instigated evidence-based health initiatives to improve the well-being of their employees, employees’ families and communities. Angie DeWinter, Monique Wantland and Jessica Lopez accepted the Gold HAWP Award on U-Haul Company’s behalf. 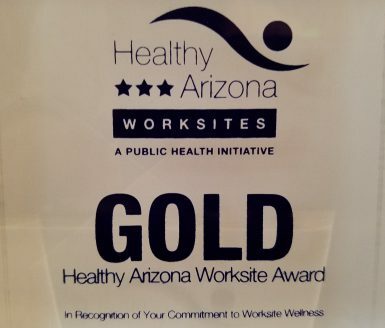 U-Haul was among 27 Arizona institutions to meet HAWP’s gold eligibility requirements. Gold recipients not only set new goals and implemented programs, but showed they have tracked and documented outcomes and behavioral change. Learn more about our healthy initiatives and job openings near you by visiting jobs.uhaul.com. U-Haul wellness marketing specialist Monique Wantland has been tasked with cultivating the Company’s healthy-living programs. She said innovative wellness benefits and a modified food philosophy are at the forefront of this culture change. Healthy options have replaced fatty and sugary foods and drinks in the U-Haul café and vending machines. Tobacco use has been discouraged via the removal of most smoking areas. “To work for a company that cares so much about their employees is amazing,” Wantland said. “We have gym reimbursements, registered dietitian reimbursements, onsite exercises classes, weight management classes and constant communication on health and wellness to employees. 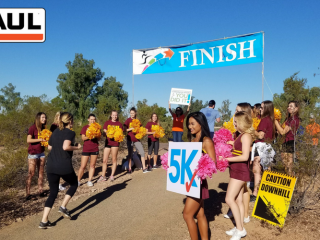 HAWP is affiliated with the Phoenix FitPHX program, a healthy-living initiative launched in 2013 by Mayor Greg Stanton, Councilman Daniel Valenzuela and Olympic gold medalist Misty Hyman. 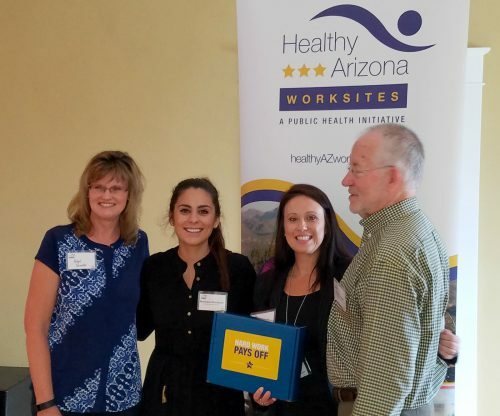 For more information, go to healthyazworksites.org. How important do you consider it to work for an employer that is health-conscious and incorporating programs to help your personal well-being? Please let us know in the comments box below.